When Lu Bu uses an attack, if he is also within the target's attacking range, the attack is unavoidable. 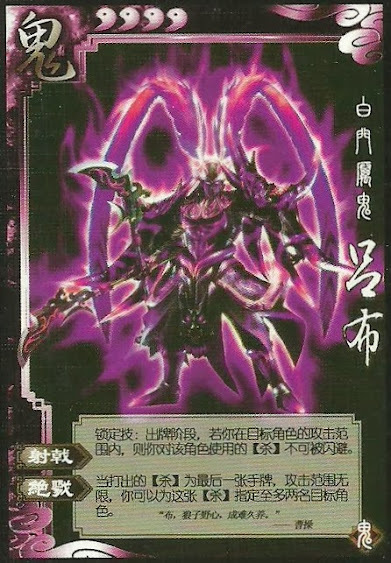 When Lu Bu uses his last hand card to attack, the attack has no range limitations, and can target up to two additional players. If Lu Bu attacks someone while he is outside of their attacking range, he cannot use "Strike the Halberd". The attacks are just like any other attack. "Strike the Halberd" is not optional and must be done if the conditions are met. When Lu Bu uses "Final Assault", it is similar to having the Sky Scorcher equipped. If he does have the Sky Scorcher and attacks using it and "Final Assault", he will get to target up to four additional players for a total of five targets.